Late Friday afternoon, news broke that Google was doing away with ads on the right side of the search results page. This is something that Google has run tests on for some time, but according to these reports, the change is now permanent. A move like this is sure to impact a lot of businesses. If you are a paid-search advertiser, I believe there are four things you need to do right now to adapt to this change. 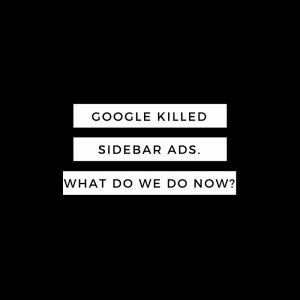 Why is Google Eliminating Sidebar Ads? While Google hasn’t released an official announcement or provided an explanation for the move, I believe that it was influenced by two factors:1) the rise of mobile, and 2) the growth of online display advertising. In Adobe’s recently released Q4 2015 Digital Advertising Report, the growth rate of paid search has been declining for some time. Worldwide advertising numbers show a 75% decrease in year over year spending on paid search. And one of the big reasons for the decline: advertiser’s willingness to increase their spend on mobile search. 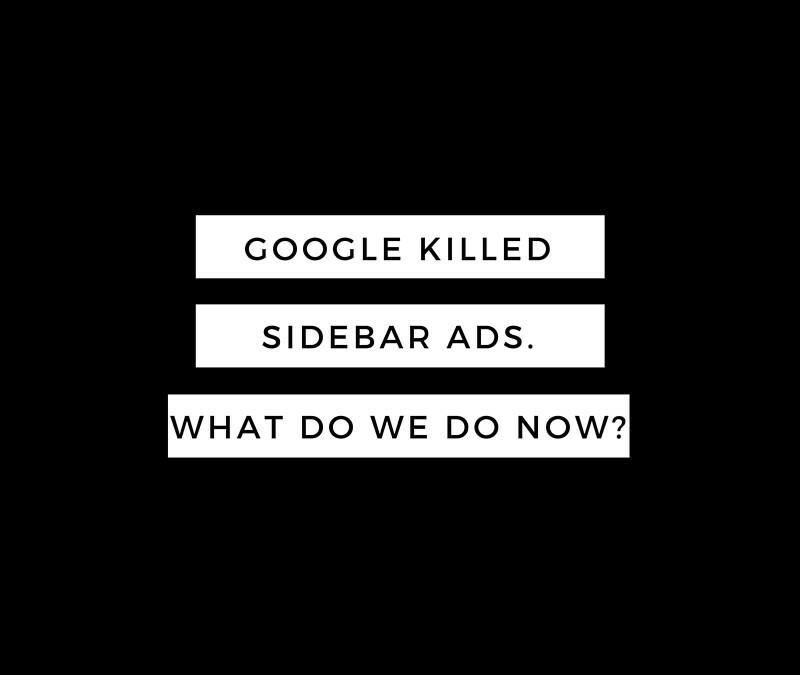 That news, coupled with a recent eMarketer report showing that display advertising is on pace to outspend search advertising by nearly $3 billion in 2016 (and $6 billion by 2019), points to a rocky future for traditional paid search advertising. Google knows these trends along with many others, and they do not want to get left behind. And I believe taking the step of reducing (clarifying?) the paid-search inventory on desktop is one of the ways they intend to preserve their future. Trends and future developments are one thing, but what do you do if you’re waking up this morning and finding out that the paid-search landscape just changed? How do you make sure that your campaigns will continue to thrive in this new paid-search landscape? I believe there are four things you need to do right now. Get ready to fight. Hard. As of today, there is less visibility for paid-search ads on the search results page. The ads blend in with the organic results even more now than before. And if part of your marketing strategy relied on being able to buy your way into your audience, that job just got a bit tougher. You will need to work harder to create ads that stand out. You can’t rely on the audience finding you on the right-hand side any more. You’re now fully engaged in competition with organic competitors. And it is going to be tough. Bonus tip: consider revisiting your organic search strategy as well to see if you can increase your odds of ranking well for specific queries. Be prepared to increase your budget (or at least expect higher CPC rates). Economics 101 teaches us that when you reduce supply and demand remains high, the market will tolerate higher prices. That’s what’s happening in this new paid search environment. Google eliminated some of the paid-search advertising slots, but all the same advertisers remained in the auction. Cost-per-click rates will naturally go higher as the market tries to accommodate those that can and will pay more to be in the prime positions. And that means you are going to need to come up with more budget for your campaigns or be willing to live with less traffic from existing campaigns. Focus now more than ever on quality scores. Another byproduct of increased competition will be an increase in the emphasis on quality score. Quality score is one way Google tries to level out the auction to keep wealthier advertisers from dominating the paid-search slots. Experienced advertisers know that earning high quality scores is the best way to win the paid search auction while also keeping your CPC rates lower than competitors. Now that there are fewer advertising slots available, your need for high quality scores is more important than ever. Your campaigns need to be in tip-top shape from this point forward. You cannot afford to have any mediocre quality scores. If you’re an advertiser that has invested a lot in paid search up to this point, you need to begin exploring ways to diversify your advertising by incorporating other areas such as display and paid social into the mix. Like a good financial portfolio manager, spreading your advertising investments into several different platforms and testing campaigns in each one is a winning strategy. You simply cannot rely on paid-search as your only avenue any longer. It is tempting to consider Google’s announcement on Friday and act like chicken little and say that the paid-search sky is falling. But I take a different view. The digital marketing landscape is getting more complex with each year that passes. But in that complexity lies opportunity. And I believe that the reduction in the number of advertising slots is a tremendous opportunity. An opportunity to strengthen your existing campaigns while also exploring new (and potentially better) options that offer a chance for your marketing efforts to explode.